1. Finely chop the garlic and onions, then fry gently in peanut oil until transparent. 2. Add all the remaining ingredients except the egg and bean sprouts and continue to fry until the tofu is nearly cooked. 3. Stirring the mix with one hand, drizzle in the egg to form a thin ribbon of cooked egg. 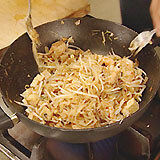 Add the drained bean sprouts and continue to fry for 30 seconds. 4. Add the garnish (see below) and serve hot. Mix all the ingredients together and serve over the Pad Thai. "No matter how ugly you think you are, that special someone that loves you believes you are the most beautiful and irresistable thing on earth and nothing can ever change that."